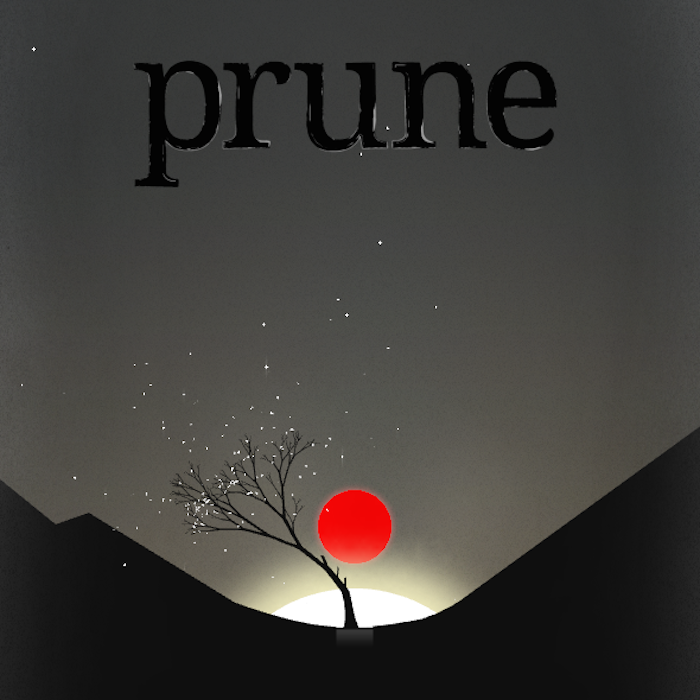 Prune Original Soundtrack is the score to the award-winning iOS game, scored by Kyle Preston. It is a largely ambient effort with a few key melodic figures here and there, helped by the inclusion of cello and piano throughout. Its atmosphere is mostly calm and pleasant, although there are certainly emotional moments, as well as moments of tension. The album starts with “The Optimistic Beginning”, with soft wind and wave sounds accompanying warm pads. They sound to me like stretched out sound samples, giving them a quality of being muffled or contained, to interesting effect. It’s calm and relaxing, though it’s also just a short prelude. The waves and wind die out, leaving the synths in the more substantial “A Golden Ratio”. The pace is still slow, but that’s just fine for the atmosphere, and it does build a bit as it goes. As elements are added on and the sound opens up more, we get the first clear appearance of a recurring four-note motif. Preston plays around with the way the different elements fill up the space of the track, some expanding then dying out, others reaching the brim and filling up the space, even over-saturating it to the point of clipping, giving a varied sense of space throughout. It’s carefully crafted, and effective for it. Things shift beginning with “And Then There Was Red”, which is much darker and moodier. A few hazy sound effects are added here, and the slow synths are joined first by a cello for a few drawn-out phrases, then by a distant piano with simple figures, then more strings for support, becoming quite emotional. Through all this, the background noise also grows, raising tension and giving an uncomfortable feeling, especially near the end of the track when noise is all that remains. “In the Caves” is similar but with less noise, though the lighter four-note motif comes to briefly lift the mood. “Ethereal Indifference” is another short track very similar to “The Optimistic Beginning”, with just four notes to it before moving onto to “Civilization”, even more oppressively dark than the others with its heavier low tones. There are more elements in here in terms of distinct sounds and noises, becoming quite busy before reducing to the cello, which carries much more weight here than it did in previous tracks. There is a great moment later once the piano comes in with the strings leading upwards as if to break through the din, when suddenly a low wave washes over it. One of the most evocative tracks of the set. With “That Bit of Hope”, the cello gets a more prominent placement, alongside some other strings and high piano. The piece makes more use of that four-note motif throughout, and is the most melodic of the songs. The piano and cello make for a nice contrast, and the ambience is crafted beautifully to give the track a real feeling of lift at key points. “Picking Up the Pieces” instead has piano focus, with the cello only providing support here. It’s a short piece, but it’s very pleasant and warm. “A New Golden Ratio” briefly ventures back into darker territory, with a rather desolate opening to the track. Rain falls as the track slowly builds with weighty emotion. The progression of the track is really great, especially considering that the many elements like strings and piano are only barely discernible from within the muffled atmosphere, but the struggle of the instruments against the fog only seems to add to their power. It’s a subtly powerful track, and my favourite of the score. “To The Stars” carries a space atmosphere to start. A very soft beat moves the track onward to a more ethereal ending, while the strings rise and fall like calming breaths. It’s all very lovely, and quite effective. “Picking Up The Pieces (Piano Only)” is exactly what it says it is, though the heavy reverb and slight echo still gives it a more ambient feel. No surprises, but it’s a nice, warm way to end the album. Prune Original Soundtrack is a lovely ambient score by Kyle Preston. Its calm, meditative atmosphere is easy to listen to, and the inclusions of the occasional ambient sound effects, piano, and cello are really great, especially with the emotional playing of the latter. The soundtrack feels simple enough, but there is a lot of attention to detail with the pieces, from balance and timbre to the slight muffles and echoing. The subtleties make the pieces very effective emotionally, especially on the later half of the album. Anyone who enjoys ambient work will find a lot to like here, as should fans of the game. Posted on May 11, 2016 by Christopher Huynh. Last modified on May 11, 2016.